Toward the end of every year, the Hi-Fi+ team gets together and discusses the finest products we have seen over a range of categories in the last 12 months. This short-list gets whittled down until the best product in every category is chosen. What follows over the next two weeks are the result of that selection process; the best of the best. In part, the process is made both easier and a lot harder because we have a pre-selection process before the review even gets into print. If we don’t think a product is worth reviewing, we don’t review it, so it is automatically ineligible for inclusion into our awards. However, that also means our products are already ‘winners’ by the time they make it into Hi-Fi+, so selecting the best of that group really is a matter of finding the crème de la crème. Sometimes, that isn’t so problematic because the nature of the review process limits the number of products in a given category to relatively small handful; we don’t test tonearms in every issue, but amplifiers and loudspeakers are a Hi-Fi+regular. This means that we tend to have more of a pool of loudspeakers to choose from than we do tonearms each year. On the other hand, trying to pick the best integrated amplifier from dozens of really outstanding amplifiers does make for some ‘interesting’ and heated discussions. That all being said, we do include a small number of products that are in the process of review, even if they haven’t made it into print as yet. In the main, we try to avoid this practice as much as possible, but in rare circumstances (either where the products tested during the year were not as ‘complete’ as the winner or that a new product comes along that simply invalidates the other runners and riders in that category) such ‘gongs’ become an inevitability. Unique to this year, we are including products from our sister title, the Ultimate Headphone Guide, which has now been incorporated into Hi-Fi+. As many have already seen those reviews from the magazine in its own right, we have chosen not to reprint them in Hi-Fi+. Finally, an important addition to the Hi-Fi+roster of Awards; the Product of the Year. This is a component (or components) that so blew us away this year, we had to confer it with an award in its own right. We routinely assess hundreds of audio products every year, and many of them are extremely impressive, but there is usually just one that is truly memorable. We’re new to this best of the best of the best lark, however, and we don’t know whether this will be the finest product we have heard each year, or whether it’s going to be an occasional award. Tune in next year for the 2019 Awards to find out! An interesting aside: this year’s shortlist of cost-no-object loudspeakers ultimately came down to two models; the Raidho TD-4.8 and the Raidho XT-5 (tested in issue 165). The company is clearly doing something very right! A big part of that ‘something’ is assembling the right team for the job. And in Raidho’s case, a lot of that comes down to the recent hiring of Benno Baun Meldgaard as chief designer for the company. The exceptional musicality he brought to GamuT’s products clearly was no accident, and his impact on the sound of the already-excellent Raidho range is adding further depth to the design. In fact, we think Raidho is the front runner in a true European high-end audio renaissance, with products that challenge even the greatest the American high-end has to offer. 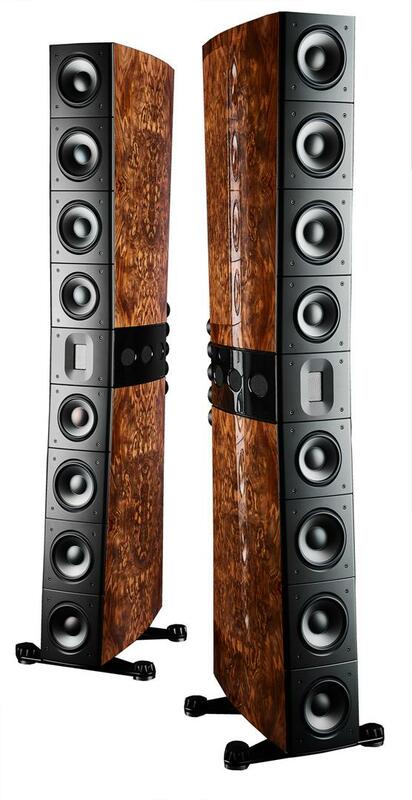 The tall, slim, and extremely elegant three-way, nine-driver floorstanders require an exceptionally large room and outstanding partnering equipment, and are capable of delivering the sort of full-range performance that justifies their place at the top table of hi-fi. In our test, we thought that the Raidho TD-4.8 “makes music supremely intelligible, in a way few other loudspeakers can. Vocal articulation is a given, but so is the articulation of the voices of all instruments. There’s no sense of ‘is that a bass clarinet?’ to music; one quick blast of the Raidho TD‑4.8 and you’ll know precisely what type of instrument is being played, almost to the point of knowing what kind of reed the musician prefers.” That might seem like hyperbole, until you sit and listen to the TD-4.8 played well, and realise that detailed insight into the music is compelling and powerful. So powerful, in fact, you’ll struggle to tear yourself away: “turning the track off was an act of musical barbarism. Pick an album, play track one, intending to listen to only that track. Five tracks later you are still mesmerised and reaching for the ‘Stop’ button is like disrespecting the music itself.” Wow, just wow! 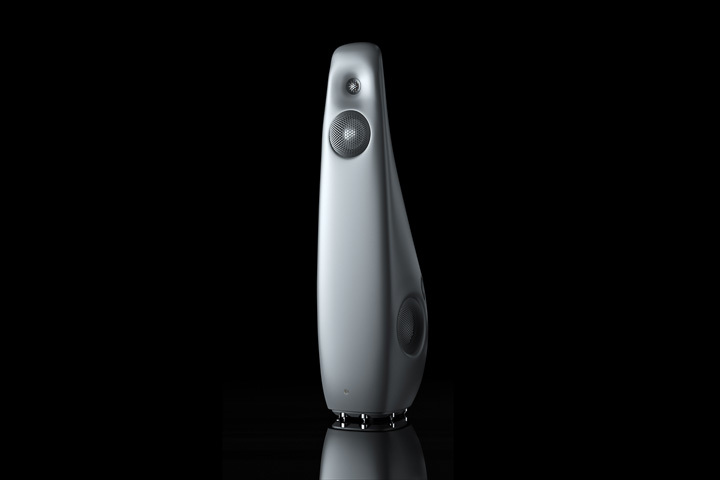 Vivid Audio’s loudspeakers typically present a ‘distinctive’ look that is never going to be universally popular. Some love the unique curves, tubes, and angles as they give a loudspeaker a uniquely ‘organic’ feel. Others would like something a little less ‘alien’ and a bit more ‘domestically friendly’. Vivid was reluctant to sacrifice quality in the search for more uniform aesthetics, but found the best possible compromise in the new Kaya range. These combine more room-friendly looks with the kind of performance with which the Vivid name has long been associated. The Kaya range is the product of a collaboration between legendary audio designer Laurence ‘Dic’ Dickie and noted industrial designers Matt Longbottom and Christoph Hermann. The resultant Kaya model (the numerical suffix denotes cabinet volume, the Kaya 45 being a 45 litre enclosure) viewed from above has a triangular section with a small spine. The edges and base are gently curved so that from the front the Kaya 45 is essentially rectangular; it’s only the side view that reveals any curves. Coupled with this are Vivid’s own aluminium drive units, with catenary rather than hemispherical domes for the midrange and tweeter and dustcap-free cones for the reaction-cancelling bass drivers, with improved magnets for the Kayas.